Only worn once so it’s in great condition. Adjustable straps and accordion style back for added stretch. NWT Aeropostale white black purple sleeveless dress. Size is XS. Super cute & perfect for summer! Please allow 2-3 business days for shipping. We are a pet friendly, non-smoking home. Feel free to ask any questions. Hanger is not included in sale. Thanks for looking! 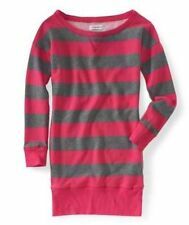 Aeropostale Women's size Small Button Dress. Condition is Pre-owned. Shipped with USPS First Class Package. 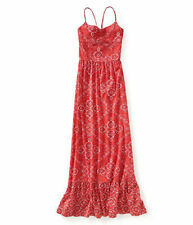 aeropostale summer dress size xs. Condition is Pre-owned. Shipped with USPS First Class Package. Girls Black And White Maxi Dress With Back Detail Size 12. Condition is Pre-owned. Shipped with USPS First Class Package. Chest (armpit to armpit): 15". Length (shoulder down): 30". I believe the color is florescent coral, sort of an orangy neon. 100% polyester so it does stretch. Top of shoulder to bottom hem, 33”. Aeropostale Women's Size XS 100% Rayon Blue With Tiny Dots Short Sundress EUC. Condition is Pre-owned. Shipped with USPS First Class Package. Super cute AEROPOSTALE Women’s Floral Dress~ SIZE XS. Condition is excellent, pre-owned condition. Please allow 2-3 business days for shipping. We are a pet friendly, non-smoking home. Feel free to ask any questions. Hanger is not included in sale. Thanks for looking! 17 1/2 length from waist to bottom of dress. 15 from strap to waistline. Elastic at back. Size M. Like new. Bust14.5 Waist 12.5 Length 30.5. Aeropostale Floral Skater Dress Size Medium. Condition is Pre-owned. Shipped with USPS First Class Package. Aeropostale short summer or spring dress with bow in middle of chest. has cap sleeves. Pre owned. Great beach/swimsuit cover. Has a tiny hole in front. Material Cotton,Modal. Type Dress. Discover daily new arrivals in all seasons, sizes and styles that you can't find anywhere else. Color Blue/Navy. All details of the product have been included. Item Details. Color Purple,Maroon. Type Dress. Discover daily new arrivals in all seasons, sizes and styles that you can't find anywhere else. Material Cotton. All details of the product have been included. Item Details. AEROPOSTALE Women's Red/Burgundy Dress-Stretch M NWT-SALE! Save $30! !